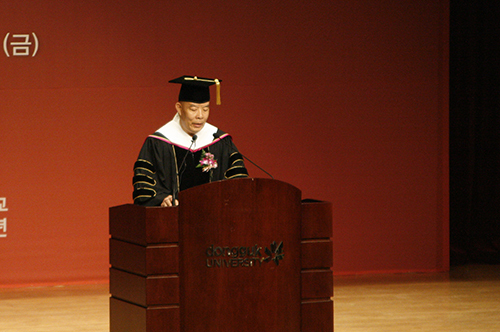 ▲ President Han Tae-sik (Bogwang) is delivering his speech at the 110th Anniversary Ceremony. Donggukians celebrated the 110th anniversary of Dongguk University on May 5th, 2016, in the Main Auditorium. Dongguk University marked its beginning in 1906, and since then, it has built its reputation not only as a Buddhism-oriented university but also as one of the top universities in Korea. In 2006 it reached the 100th year milestone, and on this day it celebrated its 110th anniversary. ▲ Students are demonstrating their silent protest against President Han Tae-sik (Bogwang) at the 110th Anniversary Ceremony. During the speech, President Han lost the attention of the audience when a group of students stood up, engaging in a silent protest. 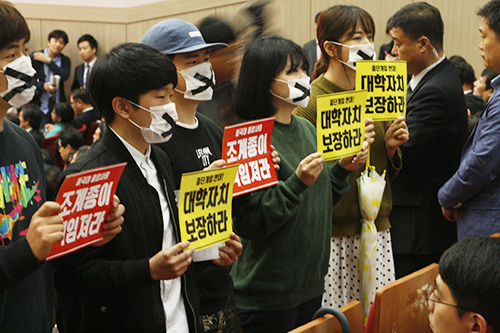 With masks indicating that they had no intention of making any disturbance to the President Han’s speech, they held up the boards which stated “The Jogye Order should take responsibility for the presidential crisis” and “Guarantee autonomy in the university.” In less than three minutes the silent protest was put to an end by a group of security guards. The rest of the event proceeded without delay, including the presentation of “Dongguk Academic Award” to 39 school faculty who largely contributed to academic research, a celebration song by a famous musical actor Kim Su-young and a closing ceremony. As the students who were protesting were banned from entering, the head of President Han’s department team explained, “If the students had told us about the silent protest earlier we would have made some adjustments to come up with a peaceful compromise.” However, the students rejected and expressed their disappointment about being restricted from entering the Main Auditorium. “These kinds of actions that make us feel deprived by the school are what make us so angry,” said one of the students. The main attraction at the exhibition is most likely to be the oldest existing woodblock-printed Tripitaka Koreana which has been brought back to Korea after 600 years of absence. Along with this, the oldest existing hand-written materials in the Korean alphabet will also be shown to the public for the first time ever.